The Thunderbolt 3 product line has been expanded to include dual display adapters with 4K and 60Hz functionalities, compatible with the latest Windows and Mac laptops. The Thunderbolt 3 is something of a favorite and fans will be glad to know that StarTech.com is expanding its product's line to include compatibility with Windows and Apple laptops. The Dual DisplayPort and DualHDMI 2.0 are bus-powered, and plug-and-play. For the first time, they will support dual uncompressed HDMI 2.0 streams with resolutions of up to 2160p (4K) and refresh rates of up to 60Hz, all from a single Thunderbolt 3 port. Both are also now compatible with the latest generation of Thunderbolt 3 enabled MacBook Pro's. The Dual DisplayPort Adapter (SKU: TB32DP2T) also supports a single 5K 60Hz stream using two DP cables, for those who don't have need for a double stream. It functions as a full graphic adapter with audio support, offering a compact alternative to a full laptop dock. Note that these only work on a Thunderbolt 3 compatible unit and will not function with generic USB-C ports. You can find them on sale at CDW, Amazon, Insight, SHI, Newegg, PC Connection, and other leading resellers, and they will be distributed by Ingram Micro, SYNNEX, Tech Data, D&H and ASI. 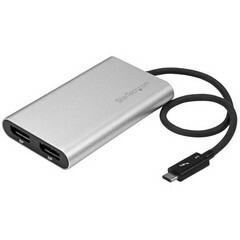 StarTech.com Introduces Apple™ Mac and Windows Compatible Thunderbolt™ 3, 4K60 Dual Display Adapters. The highest performance and simplest dual display adapters ever. Lockbourne, OH – StarTech.com is expanding its Thunderbolt™ 3 Dual Display Adapters, offering compatibility with Apple and Windows laptops. The Thunderbolt 3 to Dual DisplayPort Adapter (SKU: TB32DP2T), and Thunderbolt 3 to Dual HDMI® 2.0 Adapter(SKU: TB32HD4K60) are bus powered, plug-and-play, and, for the first time, supports up to two full uncompressed HDMI 2.0 video streams of up to 4K (2160p) resolutions at up to 60Hz refresh rate (4K60) from a single Thunderbolt 3 port. The latest generation HDMI 2.0 adapter is backward compatible with previous versions of HDMI, providing interconnectivity with millions of existing HDMI displays in the market as well as the latest displays based on HDMI 2.0. “Thunderbolt 3 takes your device to the next level enabling high performance 4K60 dual monitors from a single port. We are excited that our new Thunderbolt 3 to DisplayPort and Thunderbolt 3 to HDMI adapters support the latest generation of MacBook Pro’s with Thunderbolt 3”, said Nirav Gandhi, Director, Product Development, StarTech.com. StarTech.com’s Dual Display Adapters are ideal for consumers, gamers, business professionals, and media creators who desire multiple displays with astonishing resolution, contrast, and color depth to see photos, videos, games, applications, and text with amazing detail. The Thunderbolt 3 to DisplayPort and Thunderbolt 3 to HDMI adapters support the latest generation Mac and Windows computers with Thunderbolt 3 technology. StarTech.com’s USB-C™ and Thunderbolt 3 products are available at CDW, Amazon, Insight, SHI, Newegg, PC Connection, and other leading resellers and will be distributed by Ingram Micro, SYNNEX, Tech Data, D&H and ASI.